Simon Stålenhag is back. In his new artbook Things From The Flood, Stålenhag continues the stories of Tales From The Loop, memories of a Nordic childhood infused with strange machines and weird creatures from other dimensions. In Things From The Flood, Stålenhag moves his focus from the 80s to the 90s, the decade of great change when the outside world truly came to Scandinavia. These are tales of the trials of youth, of schoolyard hazings, of first kisses, of finding yourself – and robots. 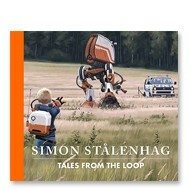 Simon Stålenhag’s Tales from the Loop is a wildly successful crowd-funded project that takes viewers on a surprising sci-fi journey through various country and city landscapes―from small towns in Sweden and the deserts of Nevada to the bitter chill of Siberia―where children explore and engage with abandoned robots, vehicles, and machinery large and small, while dinosaurs and other creatures wander our roads and fields. 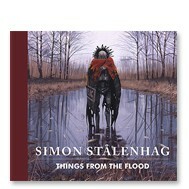 Stålenhag’s paintings and stories take place in an alternate version of Sweden in the ’80s and ’90s, primarily in the countryside of Mälaröarna, a string of islands just west of Stockholm, and how this reality came about: the development of the Loop, a large particle accelerator and the side effects of the massive project. 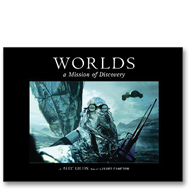 These incredibly captivating works and accompanying text capture perhaps a not-too-distant reality that is both haunting and imminent: addressing the many ways developing technology and nature can create havoc and wonder in our world―plus, its impact on the next generation. This is the English edition of the first book in Swedish that sold out in its initial printing. Note: Design Studio Press is not associated with the Kickstarter campaign as hardcover copies were reserved only for backers. The afterlife—a place that fills our hearts and minds with wonder as well as dread. What is in store for us there? Will there be suffering or redemption for our souls, or both? Who or what holds the power in the afterlife? And is there no escape? Heaven’s Hell: The Art of Anthony Jones unveils one artist’s exploration of this shadowy realm and the beautiful and haunting beings battling over it. Meet the sultry and fearless sisters of Haliled, the scheming Crimson and Sapphire Sages, and the mighty brothers of Jisais—all of whom don the most sensual, imaginative attire—drawn and painted in striking detail that will captivate curious minds. Jones’s artwork is undeniably provocative and unsettling simultaneously—this effect is ultimately his intention—for the afterlife holds as much mystery as it does terror: it is both heaven and hell. Anthony Jones has worked as an artist in the entertainment industry since 2008. He has worked for several notable companies over his career, including Sony, Blizzard Entertainment, Paramount, Western Costumes, Applibot, Wizards of the Coast, and Hasbro. But he is most proud of his role as a teacher, helping aspiring artists finesse their skills, as well as providing them a venue where they can showcase their work, through his company, Robotpencil. 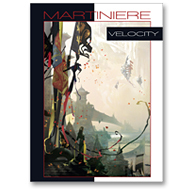 This is the fourth book by the award-winning science-fiction and fantasy artist Stephan Martiniere. 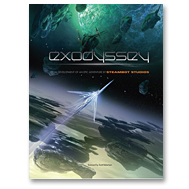 Following his previous books, Quantum Dreams, Quantumscapes, and Velocity, Trajectory showcases Stephan's phenomenal artistic range and skills in a stunning new visionary collection of sci-fi book covers, theme park and animation concepts, video game designs and never-before-seen artwork. 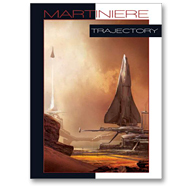 Click here to view the LIMITED EDITION version of Trajectory. In the future, a new land on the edges of the universe, Kolonie, has been found with untapped sources of oil. Colonization follows immediately. Watch the story and the stunning visuals unfold for this new world through the expert eyes, hands and minds of artists Patrick Hanenberger and Christian Schellewald. The Kolonie was a fairly unimportant world at the fringes of the known universe. Although its climate and living conditions make it a habitable environment, the immense distance to the central worlds left it provincial and there were no serious plans for any form of colonization. When the first oilfields were discovered, an enormous rush to the Kolonie started immediately. At that time space travel, and any other form of transportation was still completely dependent upon oil. 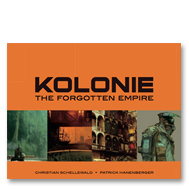 Millions of colonists left their worlds to find their fortunes on the Kolonie. A new class of spaceships was constructed to ferry settlers and supplies to the distant world and bring back oil and oil products in vast quantities. Kapitol, the main city on the Kolonie grew into a huge metropole and for more than a decade its spaceport was one of the busiest of the entire universe. When oil was finally replaced by other more efficient energy sources, importing it from the Kolonie to the main planet ceased to be profitable. The large oil corporations pulled out and shipping to the Kolonie stopped entirely within a short amount of time. Occasionally a government ship from the central world lands on the Kolonie to bring new government troops and officials, spare parts and new technology and sometimes a few passengers. Leaving the Kolonie is difficult and very costly and far too many people are stranded and long to go back to their less remote home planets. But there are still a few adventurers and fortune seekers who manage to travel to the Kolonie, which still offers many opportunities. This book is the first chapter in introducing the visually rich world of the Kolonie as well as its inhabitants and technology.